Until the machines start thinking for sapiens, information remains imperfect: a source of friction that promises only the illusion of certainty. Years from now, as the volume and variety of information expands, we may find ourselves still debating the utility of information if a general artificial intelligence emerges or if ledger-based electronic credit become universal currency. Until the machines start thinking for sapiens, information remains imperfect: a source of friction that promises only the illusion of certainty. More data only transforms the uncertainty of information from not knowing enough to sifting for what’s important. Consequently, information can better inform ways and means in strategy, but often remains ephemeral when sieving it for what ends to achieve, what ends were achieved or how to interpret them. Were information alone capable of transacting tangible ends, perhaps the Arab Spring would have turned out differently. The information generated by the discontented across the Middle East and North Africa did not yield much success outside of Tunisia. Instead, the uncertainty generated by the Arab Spring highlighted the precarious position of several regimes, especially in Saudi Arabia—following the return to sub-$100 oil prices and the kingdom’s declining currency reserves. Across the board, Egypt, Libya, Syria, and Saudi Arabia experienced power struggles, and greater information content did not impose a deterministic outcome, a priori. The result has been a series of strokes and counter-strokes, with mixed results for economic and political interests. Information is necessary but insufficient for directing the tangible elements of power. Leverage and coercion are still essential in strategy, and economic coercion is stronger than military coercion at the moment. 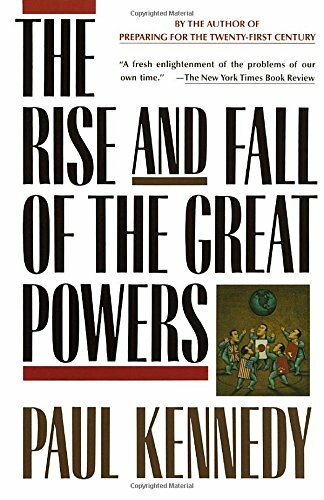 Paul Kennedy’s thesis, from The Rise and Fall of Great Powers, is that great powers inevitably decline because their military commitments outrun their production capacity and undermine their economic strength. The inevitability comes from the process of relative competition between any major power and its peer competitors, and relies on systemic and unit determinism. The declining returns in the 21st century race to capture growth and global market share, combined with accelerating productivity and technology are nothing new, though the cycle appears to be speeding up. Historically, the race itself results in competition for how power is wielded, and sovereignty defended, as economic strength is necessary to sustain sovereignty. Even North Korea, weak though it is economically, understands the need to use the economic strength it has cobbled together to build and maintain tools that deter a straightforward intervention. Translated to the language of DIME (diplomatic, information, military and economic power), each element of national power is portrayed as mutually reinforcing, with information as the marginal change agent. Kennedy promotes the centrality of economic power to sustain national power, and especially force projection. Europe, and especially Great Britain, discovered in the 18th century that tax receipts driven by increased productivity could expand sovereign capacity to sell debt and fund the military power necessary to protect far-flung economic interests. Niall Ferguson noted that this capacity supports the ability to expand war aims but has a declining ability to do so. Long before then Sun Tzu admonished: “Again, if the campaign is protracted, the resources of the state will not be equal to the strain.” War has a price that must be paid from the finite resources of the state’s economy, and because war is a zero net return activity, those resources have neither salvage nor conversion value without a spoils-of-war policy. M-1 Abrams tanks and F-35 fighters are not readily beaten into plowshares that can recapture their direct and indirect costs. Nor is annexation of a target territory currently an acceptable option to recoup the economic costs incurred during an intervention. Absent spoils, war has to be paid for through an accepted medium of exchange and store of value. During the era of the gold standard, international payments were settled in gold, though promissory notes were used as credit. Gold was only obtainable by Mackinder-esque territorial capture. After two world wars and the Bretton Woods settlement system, sovereign wealth and currency generation were linked to productivity, capital balances, and interest rates that are generated from private investment and consumption. The sum total of national trade underpins expected tax receipts that are used to project trust in public and private debt or defer trade imbalances through currency reserves and credit. The ability to wage war is now directly linked to trust in an economy, through the debt that is sold to fund war-time activity has a net zero return on investment. If autarky or annexation were still realistic, a state’s individual capacity to build an economy that supported aggressive force projection would be limited to internal metrics. However, the modern market system requires extraordinary interdependence and diversity to diversify credit risk and maintain the flow of goods and capital. Sluggish growth post-2008 is a signifier of a loss of trust in this arrangement. Concurrently, though not necessarily related, the ability to project force is being challenged. The demand for intervention has waned accordingly, along with a decline in states’ ability to tap into global connectivity while unilaterally projecting force. The result is a greater demand for small, networked deployments (special operations) over conventional mass. The reduction in value of explicit territorial control versus networks and multilateral governance has created a dependence on information flows. The persistence and speed of travel and a global professional class have created a perceived fluidity in territoriality itself, visa requirements notwithstanding. In the meantime, the centralized information capacity of nation-states during the twentieth century has given way to networks that serve market flows but not necessarily hierarchical state interests. State responses to networked threats (misinformation, cyber exploits, etc.) can and do degrade the communication and market trust that sustains economic fluidity. The overall trend? The financial and political price of simultaneously maintaining unilateral force projection capacity while stabilizing economic networks is increasing. This presents a trilemma for all great powers: solve for domestic political interests; solve for international security, or solve for international economic fluidity. Solving the trilemma in a rules-based system requires intense cooperation and standardization. China’s Belt and Road Initiative is a response to this, for example, in which China organizes an order based on relationships (关系 or guānxi) that serves its domestic interests. The Belt and Road Initiative also provides a standard template that normalizes Asian economic centrality while free riding on externally provided security. The window for free-riding appears to be closing, though, as U.S. force projection declines relative to its ability to respond to demand. Even now, Chinese leaders are discovering an interdependence between security requirements and Belt and Road development projects. This is likely to lead to the discovery of general requirements across Asia. From Pax Britannia to Pax Americana to now, the capacity to leverage the global market system and defend interests in that system underscore the achievement of interests. Absent the economic strength to sustain effective access and placement in a region and the support of allies, the ability to shape outcomes will decline. Britain discovered this in 1956, when the United States would not support its Suez policy. The U.S. has discovered this during the last seventeen years in the Middle East. State-level attempts to move the needle through information programs have proven even more futile, but have not reduced their importance. Lack of capacity for power projection in Asia is also the primary limiting factor on territorial war between the United States and China. Consider that if the U.S. were unwilling to invade Japan in 1945 sans a large allied commitment, where would an anti-access/area denial skirmish with China ultimately lead? Near-term U.S.-China competition is a function of access to markets and technology served by global supply chains, communications, and financial networks, complicating politico-military (pol-mil) interests. The near-term goal is harnessing information flows most effectively through trust or coercion. Both the U.S. and China are stretching extensively to do so: U.S. debt is rapidly expanding even as its tax receipts have been reduced, and China is restructuring its debt yet again. The largest information program, one not likely to involve information operations, psychological warfare, or public diplomacy, is currency. Currency is a persistent effects platform that sustains credit and liquidity in economies and creates the strategic space to pay for security that cannot pay for itself. The flows reveal tactical re-positioning, and occasional glimpses of the strategic mean-shifts that occur when economic paradigms are altered. Accordingly, the graph below indicates a decline in U.S. dollar allocation relative to Japanese Yen and Chinese renminbi. Growing U.S. debt absorbs U.S. dollars, while Chinese development work across the Belt and Road Initiative is financed in U.S. dollars, leading to a perceived U.S. dollar liquidity crunch. Is China communicating the need for a currency shift by generating dollar debts that Belt and Road borrowers will struggle to repay, triggering debt relief on China’s terms? If so, it’s a particular form of intervention that requires no military force, and simultaneously ties those countries closer to China. Intelligence (as information) can buy lives and time on the battlefield, but capital still buys the war and the tools that aid the intelligence process. Information is the carrier frequency that capital rides to obtain something of value. The emerging notion that information may have become the currency of modern war may be true as intelligence sources expand, and data is qualitatively being compared to oil. Information value and availability moves capital (money), and capital reflexively generates more information in turn. This interaction does not mean that they are the same thing, however. Intelligence (as information) can buy lives and time on the battlefield, but capital still buys the war and the tools that aid the intelligence process. Information is the carrier frequency capital rides to obtain something of value. The greatest challenge of the big-data era will be assessing the quality and standardization of information. Market and intelligence analysts compare various sources to corroborate inputs before committing to a conclusion. The struggle in the analysis often stems from noise in quality and quantity of sources, all else equal. As information sources and volume expand, one of the chief challenges of the deep-learning efforts to automate this process will be organizing unstructured data. If all actors were working with standardized sources, we might expect a stable distribution of decisions, and a further stable distribution of outcomes from those decisions. That is what is expected from a currency—stability and standardization—but the outcomes from unstructured decision making under uncertainty is far from standard. The interaction between the two is a clear source of existing global friction. Information has always been a critical factor in the exercise of power, but information does not yet sustain and improve itself without a mechanism for acting on it. Economic strength has not yet been supplanted by raw data processing capacity, though interdependence between the two is rapidly increasing. The intensification of that interdependence complicates military action in the information space and converges toward reframing the utility of force. The capacity and ability to rapidly convert information to decisions is transitioning from a strategic advantage to a standard requirement for both states and private firms. The irony is that states’ primary activities are framing economies for both welfare and defense, and the friction between them is growing. Mitchell D. White is a former U.S. Army officer. The views contained are the author’s alone. "Oxford Essential Quotations," Oxford Reference, October 31, 2016, , accessed May 03, 2018, http://www.oxfordreference.com/view/10.1093/acref/9780191826719.001.0001/q-oro-ed4-00003011. Barry Buzan and Richard Little, International Systems in World History: Remaking the Study of International Relations (Oxford: Oxford University Press, 2000), 309. Ferguson, Niall. The Cash Nexus: Money and Power in the Modern World (“Spending and Taxing”). Basic Books, 2001. Neal, Larry. "The English and Dutch East India Companies: How the East Was Won," in The Rise of Financial Capitalism: International Capital Markets in the Age of Reason, 118-40. New York: Cambridge University, 1990. The “reserve currency” is a particular exception to this rule. Eric Helleiner, "Political Determinants of International Currencies: What Future for the US Dollar?" Review of International Political Economy 15, no. 3 (2008): 'The Economic Determinants of International Currencies', doi:10.1080/09692290801928731. Gavin, Francis J. Gold, Dollars, and Power: The Politics of International Monetary Relations, 1958-1971. Chapel Hill: University of North Carolina Press, 2004.